One of the many processes I go through when writing a new story is cast each character. I don’t usually share who I’m picturing for the cast, because I like the readers to imagine the way they think characters should look. So, if you like to picture yourself as the main character, go for it! I do the same thing when it’s a tough and beautiful female lead. There’s also a mini-bio for each character. You’ll find that The Cupids are all about helping mortals, so in addition to the main characters you’ll meet the lucky couple Evelyn is tasked with piercing. 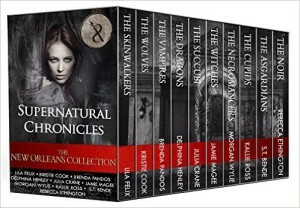 Join this cast in New Orleans and read about more of the supernatural creatures roaming the city in the rest of the chronicles! Hobbies: Eating chocolate cake, archery training, and bantering with her mentor Andel. Hobbies: Lecturing Evelyn, Cupid training, and piercing human couples with heavenly love. A celestial mark only imprinted on Cupids after piercing their first couple. The arrow tracks the number of targets the Cupid has blessed with love. Hobbies: Grieving for the girlfriend that died for him, escaping in video games, drinking too much coffee, and procrastinating. Hobbies: Studying books and boys. Hobbies: Playing video games, watching Tate study, and coming up with believable excuses to run into Autumn.